Pepper growers are well aware that aphid control is key to achieve high yields and good quality. In organic crops, it is an even more crucial element of the biological control programme. Step one. 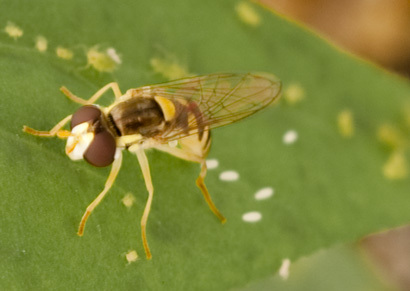 Use parasitoid wasps such as Aphidius colemani, Aphidius ervi and Aphelinus abdominalis. They typically play a lead role in preventative aphid control strategies. However, naturally-occurring secondary parasitoids can often dilute the effect of beneficial wasp introductions as we head into spring (hyperparasitism). Step two. Large predators such as ladybirds e.g. Adalia bipunctata or lacewings (Chrysoperla spp.) can consume very large numbers of aphids. These beneficials are not susceptible to natural parasites. That makes them an important second-line-of-defence when “curative” action is needed. They are of particular importance when aphid populations start to surge and when real aphid hotspots develop. In the absence of large aphid colonies however, ladybirds or lacewings are unlikely to establish a “resident” population. Hence step number three. Add beneficials which have the ability to work preventatively yet which are not compromised by parasitism. We recommend a solid foundation of regular Aphidoletes aphidimyza introductions, bolstered by our new hoverfly product, Sphaerophoria rueppellii in springtime. These work both preventatively and curatively. Ideal introduction time is when the first aphids are spotted. Oh yes, we forgot step number 0. Contact your Biobest advisor for technical support and tailor-made advice.